One moment the socket functions were in the module std:net::tcp and the next moment they had gone. A bit of an exaggeration, but between Rust 0.6 and 0.7 there have been a number of changes which affect the httpd code. The core crate has renamed to std and some modules that were in the previous version of the std crate in 0.6 have been moved elsewhere. Like the core crate before it, it is not necessary to explicitly link to the std crate, but the visibility of some items has changed in the transition and in some cases explicit name bindings are now required. The most obvious example affects the use of the function io::println. in files which use io::println. The extra crate is the new home of some of the modules which had previously been in the std crate in 0.6. Rust is moving from iteration via closures to iteration via explicit iterators. The trait Iterator is defined in the module std::iterator. which will look familiar to anybody who has progammed in Java. A number of functions/methods have either changed or disappeared entirely. defined in the str module has gone. defined by the Str trait. no longer compile in Rust 0.7. This change is not specifically mentioned in the release notes. A Rust Trait item defines an abstract type in terms of a set of methods. The method transmutate can be called on the value of any type that has the trait Alchemist. In its basic guise a Rust trait is very similar to a Java interface. Traits also support inheritance like Java Interfaces but unlike them traits support static methods and default implementations of methods. The implementation of a trait for a given type is defined using a variant of the implementation item. defines the implementation of the trait Alchemist for the type NuclearReactor. The abstract type defined by a trait item is an object type. A pointer to value of a type which implements a trait, e.g., ~NuclearReactor, is not automatically a pointer to a value of the object type defined by that trait, i.e., ~Alchemist. which is a bit unfortunate. In the all new Rust 0.7 which has just been released default methods remain experimental but the above code now compiles and runs, which is nice. Work being done as part of JSR 335: Lambda Expressions for the Java Programming Language will result in Java interfaces also supporting default methods and static methods. We are now in a position to do something with an incoming HTTP Request, but what ? HTTP is a versatile protocol, but a protocol is all it is. What a GET Request, for example, should actually get and how is up for grabs. Rather than hardwire it for one implementation of GET, or POST or what have you, what we can do is turn httpd into a ‘framework’ which just deals with the protocol part and leave the semantics to the user of the framework. The first step is to turn our executable into a library. Rust Attributes are a form of metadata which can be associated with crates and items. An Attribute declaration applies to the item it precedes unless the declaration is terminated with a semi-colon (;). In this case it applies to the entity in which it is contained. Currently it is only possible to specify pre-defined Attributes. We can use the crate_type attribute to specify the type of the binary crate that should be built. then the binary crate built from the crate file will be a library. The default is bin which is why none of the earlier versions of httpd.rc needed to specify a crate_type attribute. We need to add the appropriate crate_type and link attributes and remove the main function definition. We also need to make public those modules that a user of the framework may need to access. For testing purposes we need a new executable that will link against our new library and initially at least, just run the server as before. This is both sub-optimal and incorrect and results in the connection being closed after a single Request but it will do for now. The handleRequest function currently does nothing more than print out the Request and return a ‘not found’ Response. Connecting with a web browser is OK as a basic ‘smoke test’ but we are now at the stage where we need some actual tests. anything involving protocols it is always a good idea to test against a completely independent implementation if possible. Below is some very simple test code written in Ruby. Between them the tests test all the supported methods and request URI formats. The connect test method creates an HTTP client that will attampt to use the actual HTTP server at @host:@port as a proxy to access another non-existent HTTP server at @host:(@port + 2) using a secure connection. The call to the HTTP client’s get method causes it to attempt to create an SSL connection which tunnels through the proxy using the HTTP CONNECT method, which is what we want. Like the connect test method, the get_proxy test method creates an HTTP client that will attampt to use the actual HTTP server at @host:@port as a proxy to access another non-existent HTTP server at @host:(@port + 2) but in this case using an ordinary non-secure connection. The call to the HTTP client’s get method causes it to send an HTTP Request with an Absolute URI as the Request URI. Now we can read a raw HTTP response we need to turn it into something useful. where absoluteURI, abs_path and authority are as defined in RFC 2396.
message-body is defined like this. The AbsoluteURI variant uses the type Url from the std library. A Request simply holds the method, the URI and the headers. For the moment we are going to ignore the message-body. The function readRequestLine reads the request line and splits it into its constituent parts and returns them as a tuple. This method is very simple. It just returns the Method held by the Request. This method is a little less straightforward than getMethod. As we know in this case the RequestURI value is returned via a shallow copy. A RequestURI value may contain an owned pointer so this would be moved to the copy being returned which would make the original in the Request invalid. We could return a deep copy with a pointer to a copy of the original string in the owned heap as well, but this seems a tad extravagant. but it does have a point. We have not so much attempted to borrow a pointer, as tried to walk off with it without any indication of when we might be planning to give it back, if ever. specifies that the lifetime of the borrowed pointer is the same as the thing from which it was borrowed which in this case is the Request. This makes sense because as long as the Request exists the RequestURI exists, so as long as the Request exists the borrowed pointer to the RequestURI is valid. This method delegates to the Headers get method and returns its result. The static method read reads the successive header lines until an empty line is read. Each header lined is convered to a Header value. The method returns a Headers value constructed using the collected Header values. The function toHeader splits the header line into a key and a value and returns the result as a Header value. The get method returns an Option as it is possible that the specified header was not present in the original HTTP Request. If the header is present a borrowed pointer to the value is returned via the Option Ok variant. The Method fromString static method is very simple. If the argument matches one of the defined methods return the corresponding enum variant, otherwise fail. The RequestURI fromString static method converts the string specifying the URI contained in the HTTP Request into one of the variants of the enum type RequestURI. It takes the Method of the Request as an argument so that it can identify the CONNECT case where the specified Request-URI is actually is an authority which may otherwise be indistinguishable from an absoluteURI in certain circumstances. Now we have a connection we can read the incoming HTTP request. A line is terminated by a carriage-return (CR == ASCII 13) immediately followed by a line-feed (LF == ASCII 10). Ideally we would like to read the entire request from the connection “in one go” but that is not possible because there is no way of knowing how big a given HTTP request is before we read it. 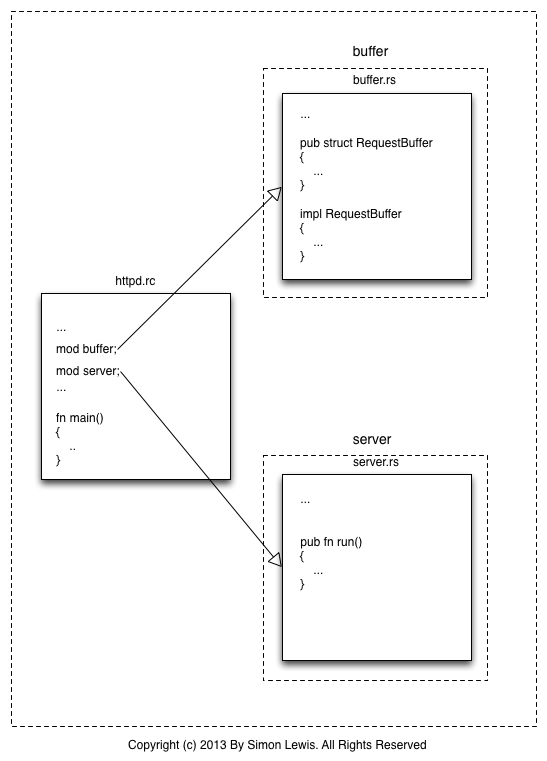 To abstract out the unfortunately indeterminate nature of an incoming HTTP request, we will start by defining a RequestBuffer type which will deal with the vagaries of reading the necessary bytes from the connection and converting them into lines. but at the moment there does not seem to be any way of simply reading all the bytes currently available on the connection in one go that actually works. This is a version that works but there really isn’t a whole lot of buffering going on. The new method is a static method which can be used to create a RequestBuffer. Methods are defined for a specific type using an implementation. A method is defined in the same way as a function but with self or some kind of pointer to self as a special first parameter. At runtime self is bound to the value on which the method has been invoked. Using a borrowed pointer to self means that the method is applicable to a value of type QName regardless of where it is stored. If a method can modify the value on which it is called the self parameter must be declared mutable. A static method definition is an ordinary function definition, or, if you prefer, a method definition without a self parameter.